Bilingual guide in Kazan Metro. In the Minzälä subdialect of the Middle Dialect z is pronounced as [ð], as opposed to other dialects where it is silent. The influence of Russian language is significant. Russian words and phrases are used with Tatar grammar or Russian grammar in Tatar texts. Some Russian verbs are taken entirely, un-nativized, and followed with itärgä. Some English words and phrases are also used. Siberian Tatars pronounce [ts] instead of ç, [j] instead of c and sometimes [p] and [t] instead of b and d. There are also grammatical differences within the dialect, scattered across Western Siberia. 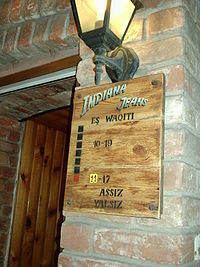 The commonly pronounced 10 vowels are native Tatar vowels: a–ä, u–ü, í–i, o–ö, ı–e. The last two pairs are considered to be short vowels. They also could mean a long vowels, but only in loanwords. [ə] and [ʌ] are not considered to be independent vowels. Loaned vowels are considered to be back vowels. While the consonants [ʒ], [f] and [v] are not native to Tatar, they are well established. However, Tatars usually substitute fricatives for affricates, for example [ʃʲ] for [ʧ], [ʒ] or [ʒʲ] for [ʤ] and [s] for [ʦ]. Nevertheless, literary traditions recommend pronunciation of affricates in loanwords. Notes: *Japonic and Korean are not generally recognized as belonging to the Altaic language family. A hypothetical language family that would include both the Japonic languages and Korean is sometimes referred to as the Buyeo language family. The Tatar language (Tatar tele, Tatarça) is a very ancient Turkic language belonging to the Altaic branch of the Ural-Altaic family of languages. Kazan Tatar language's ancestors are the extinct Bolgar and Kipchak languages. The literary Tatar language is based on the Kazan Tatar language's Middle (Tatarstan) dialect and the Old Tatar language (İske Tatar Tele).